December 25, 2015, 1:52 p.m.
42% of marriages in England and Wales end in divorce, but in China the divorce rate is 4%. The discrepancy is often blamed on two conflicting concepts of love – the Western ideal of romantic love, based on individualism and developed over centuries of romantic literature, and the Eastern concept of practical love, where familial and social stability take precedence. 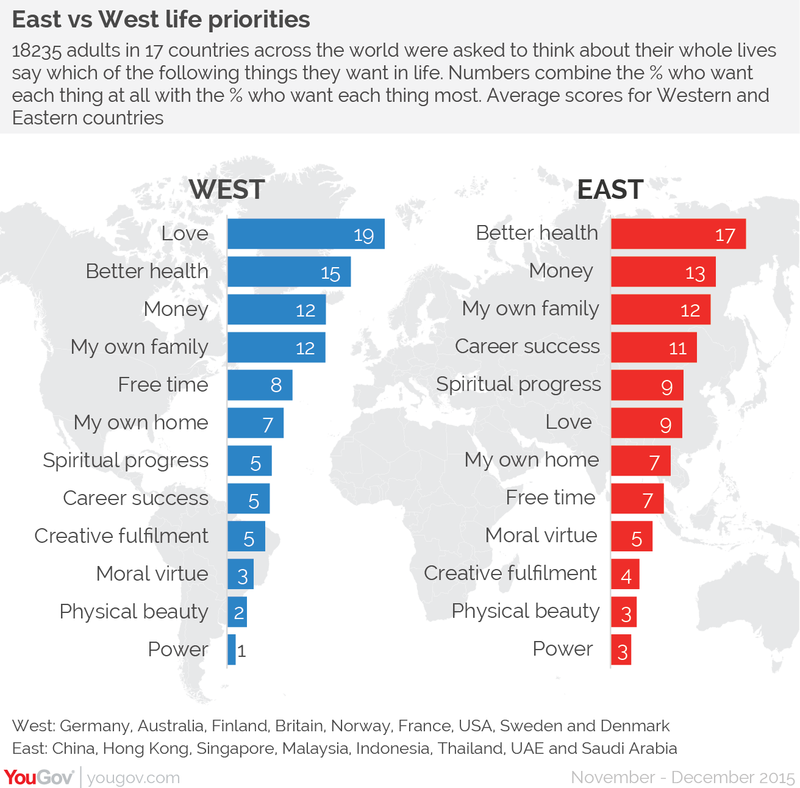 YouGov conducted research in 17 countries across the world, asking what people most want from their lives in general, and confirmed the huge difference in emphasis on love between the Western and Eastern cultures. Love is the top priority for six of the nine Western countries surveyed, but it is only the sixth highest priority as an average of the Eastern countries. In the East, better health is the top priority for five of the eight countries, while money ranks second on average – and first in Thailand and Saudi Arabia. There is also a significant gap between East and West on placing importance on spiritual progress. Eight of the 10 countries where spirituality has a score over five are in the East, although the USA is an obvious exception – Americans give it the highest priority along with Thailand, placing it ahead of health and money. Respondents in each country were asked to think about their whole lives and to say which of 12 key areas they most want in life and which single one they want most overall. The scores are then calculated by balancing the two figures, to give a measure that incorporates both the breadth and intensity of the desire for each goal in the country. The full data is in the table below, and can be sorted by goal.